It’s an a moment many aquarium hobbyists will never forget—you’ve set up your tank, populated it with all the living things you want, and put in place the equipment you need for proper aquarium maintenance, only to find one morning that your aquarium is under invasion. A mysterious goo is growing through your substrate, or a slimy film is forming on the glass, or some rocks seem to have hair growing on them, or your water is growing misty with a green haze, or any combination of these. While to a newcomer these organisms might sound or look like an infection by some aquatic disease or some sort of creeping alien horror from a sci-fi film, aquarium hobbyists know them as algae, a natural occurrence wherever there’s water with nutrients and light. Some algae may be welcome in your tank under certain conditions, perhaps as a food source for your livestock or as a component of a more natural aesthetic. But many are undesirable, either serving as indicators of poor water quality, smothering and killing plants, or overtaking your aquarium and ruining its beauty. 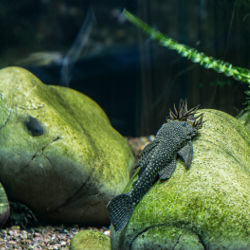 Knowing which is which, and controlling their presence in your tank, is an essential part of good aquarium maintenance. Here’s a rundown of some common algae types, how they affect your aquarium, and what aquarium maintenance is necessary to get rid of bad algae should it appear. Also be sure to check out our aquarium maintenance guide that provides a broader overview of how to keep your aquarium healthy! Though not technically an algae, cyanobacteria, also known as slime algae or smear algae, sure looks like one and can definitely cause problems like an algae does. Starting simply as a slimy film in your substrate, blue-green algae will creep up through it and, upon reaching the top layer, rapidly spread throughout the tank, killing plants along the way. Removing cyanobacteria mechanically will help cull the overgrowth but it won’t keep it from quickly growing back, and since cyanobacteria can Fix Its Own Nitrogen it’s hard to prevent it even with good aquarium maintenance. And because of its toxicity, many algae eaters won’t touch it. Once you remove the blue-green algae mechanically, you should turn the lights off for three days, performing partial water changes of about 15% before and after. If it grows back, repeat the process. This should help you control overgrowth, but won’t truly completely eliminate it. In extreme cases, you can kill blue-green algae with erythromycin phosphate, but this compound can also harm the helpful Nitrifying Bacteria that you want in your aquarium, and can help the cyanobacteria develop antibacterial resistance if not used correctly, so use with caution. This type of algae reproduces so rapidly that it fills your water, giving it a hazy green tint. It occurs when faulty aquarium maintenance allows excess nitrates, phosphates, or lighting, especially direct sunlight. This is called an algae bloom, and, while not harmful to your aquarium’s inhabitants, it can certainly ruin its aesthetic appeal. Green water can actually be useful if you’re raising brine shrimp or daphnia, which eat this algae. If you aren’t though, you can use them to eliminate it—simply introduce a large number, and they’ll eat the algae before getting eaten by fish in turn. More direct methods include UV sterilizers, which prevent algae blooms in the first place, and diatom filters or micron filter cartridges, which will quickly remove the algae from your water. These brown patches of algae grown when your aquarium has too much silicate and phosphate and not enough light. They can easily be scraped off and eliminated by increasing the light. They may also appear because you are using a cool white “shop light” bulb or an old fluorescent lamp. These tend to emit a spectrum of light that favors brown algae growth. Always use a bulb made for aquariums and replace it twice a year as part of your aquarium maintenance. Green spot algae appears on leaves of slow-growing plants and on glass surfaces. It’s typically indicative of good water quality and can be easily removed by simply scrubbing or scraping it off. A razor blade or scraper will get the job done. Black spot algae is more of a nuisance. It’s much harder to remove mechanically, and will spread up the base of plants and throughout the tank. Removing black spot algae is more effectively accomplished by introducing algae-eating organisms, particularly Nerite snails and Amano shrimp. Hair algae live up to their name, in that they appear in long wispy strands. These come in green, brown, and black varieties, which appear under slightly varying conditions (typically excess nutrients and light) but all of which can grow fast enough to overtake your aquarium, making them bad algae. Regardless of what color the hair algae in your aquarium is, the removal process is generally the same. Remove as much as you can by hand with a toothbrush, and introduce Amano shrimp and Siamese algae eaters to take care of the rest. This algae might resemble strands of black hair algae, but up close you can see that this greyish algae branches off of the surfaces of leaves and equipment in the shape of a deer horn. This is a harmful algae and is very hard to remove. Cutting off affected leaves is a good start, but you’ll need algae eaters. Amano shrimp are most effective. While these solutions can help you combat algae that has entered your aquarium, the most effective method of keeping bad algae at bay is good aquarium maintenance. Keeping a group of hungry algae-eating organisms, such as Amano Shrimp, Siamese Algae Eaters, Nerite Snails, or even a Common Pleco, is the most effective step you can take in maintaining an aquarium free of undesirable algae. However, you must also tackle the root causes, which lie in your aquarium maintenance. As you may have noticed, many of these kinds of algae appear as a result of excess light or nutrients. To prevent this, you should clean your tank and change your water regularly, as water not routinely changed tends to become high in phosphates and nitrates. An even bigger source of excess nutrients is overfeeding. Most fish only need to be fed once a day, and if food settles at the bottom ten minutes after feeding, you may be overfeeding. Of course, even with all of these aquarium maintenance measures, you will still always have some bit of algae growth. This is simply a normal part of having water, light, and nutrients in one place, and it isn’t always necessarily a bad thing. If you have questions about these and other kinds of algae growth in your particular aquarium, or if you’re looking for algae eaters and other preventative measures, Living Art Aquatics in Crystal Lake, IL has the expertise you’re looking for. Simply give Cory a call at (847) 737-5151. We’ll be happy to help you with any aspect of aquarium maintenance services.